north carolinians everywhere might as well roll out the welcome mat to their newest resident; yours truly just got her license. this is a big deal for 2 reasons… a) it’s symbolic of the fact that i’m putting down roots here (though i confess my heart is still mostly in maryland), and b) in order to get a NC license, you must first pass a driver’s test. the test is full of obscure questions like, “what percentage of driving accidents are due to drunk driving?” is it really necessary that i know the exact percentage to be a good driver? isn’t it enough to know not to drink and drive? lucky for me, someone in my office mentioned that one could find a “study guide” (i refuse to call it a cheat sheet) online. thus, this little lady got a perfect score… booyah! 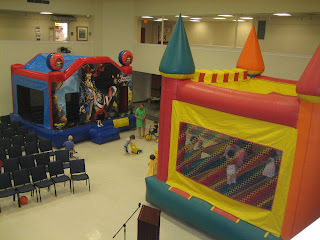 when i got back to my job, at the church, i was amazed to find kids moon-bouncing inside. yep, you can fit two moon-bouncers in our “multi purpose” space (which happens to be used for our contemporary services). who knew? and when can i bounce?